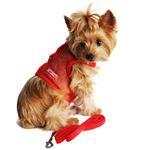 Keep your dog cool in the dog days of summer with the adorable Cool Mesh Dog Harness by Doggie Design in Solid Red! 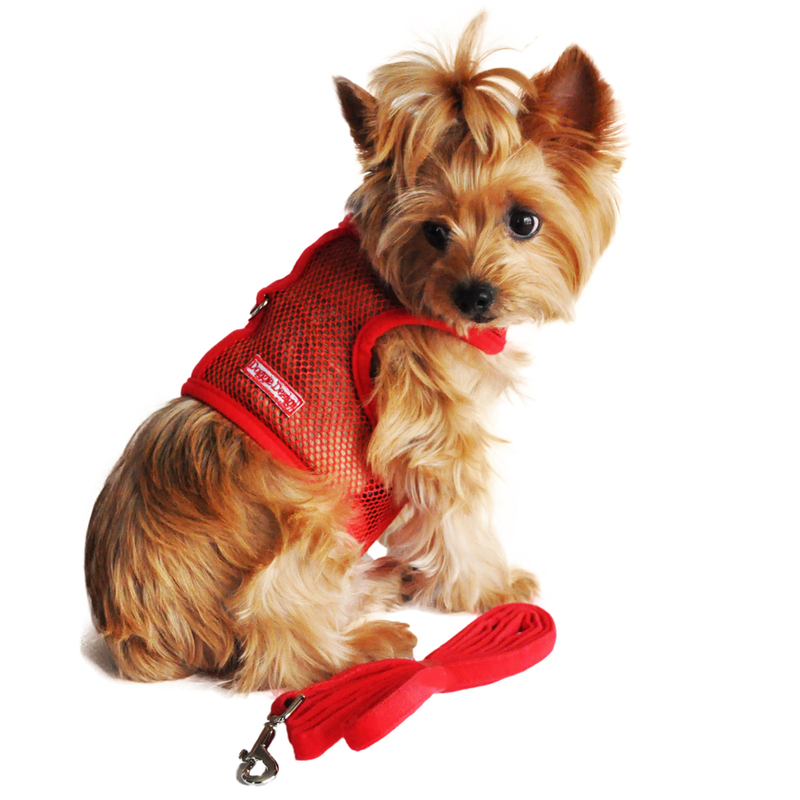 This adorable bright red netted dog harness is perfect for the summer months. It has classic styling that never goes out of fashion and is perfect for walks on the beach or through town when your dog wants to look and feel cool. 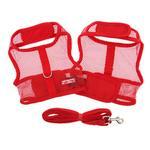 This red mesh harness is lightweight but has extra strength in the touch fastener closures at the neck and chest. Also adding to the durability is the reinforced box stitching that secures the welded D-ring into the Nyla-bond center panel. The red mesh is a bright eye-catching look that gets your pup noticed. It's a great look for Valentine's Day and any patriotic or summer event. The mesh fabric is soft and breezy but surprisingly strong. The red trim is soft and velvety. For a perfectly finished look from head to paw, Doggie Design has included a matching leash in the same luxurious velvety fabric so it will be comfortable for you to hold the handle. Cool Mesh Dog Harness by Doggie Design - Solid Red Customer Photos - Send us your photo! Here is little Krash - came to office with me and is working hard (at napping). Love these harnesses for my usually active little guy! Posted On 04/01/18 by Arthur S from , Yes, Arthur S recommends this product! Getting my Beagles patches from Sturgis sewn on. Harness exactly as advertised. Posted On 07/05/17 by Lisa G from Lubbock, TX Yes, Lisa G recommends this product! I have over a dozen of these harnesses for my two pups. The mesh is great for hot weather and the colors and styles are cute. I also like that they come with a matching leash. this red one is very soft - the edges are almost a felt type material rather than a scratchy nylon. My little 6 pound Yorkie mix is between sizes - xs is too tight in the chest but the small is a little big. Posted On 05/17/17 by Gertraud N from , Yes, Gertraud N recommends this product! Posted On 05/05/17 by barbara P from Bishop, CA Yes, barbara P recommends this product! It looks like my little Trina is the model for all the clothes I buy for her. When I take her for a walk I have to have her match the colors I wear as our hair is the same color also. She looks just like like the picture above. I love this mesh harness as you are not pulling her by the neck on our walks. They wash great. I love the Cool Mesh Harness. Bought this harness for warmer weather, as our pup has a black coat on top, very dense. His back heats up quickly in the sunshine. Harness itself is ok and should do the trick for our Havanese, but the leash that accompanied seems like it won't last long. Posted On 04/02/17 by Brenda V from Thomasville, GA Yes, Brenda V recommends this product! Posted On 03/30/17 by Theo B from , FL Yes, Theo B recommends this product! Been looking for awhile for a red harness for Molly. This is a great shade of red. The cool mesh will be great as it gets hot here in Fl. Posted On 01/06/17 by Theresa V from Cape Coral, FL Yes, Theresa V recommends this product! Love this light weight harness. Fits great and is easy to put on and take off. Will look at getting another. Posted On 12/26/16 by Carol C from Toledo, IL Yes, Carol C recommends this product! Ginger looks sweet in this harness. It will be perfect for times when we are in warmer climate such as Florida and Las Vegas. Posted On 12/03/16 by Barbara L from , CA Yes, Barbara L recommends this product! I have these harnesses in several colors for my pup. Very lightweight, and can be worn over a sweater for winter walks. Posted On 11/30/16 by Susan L from , CO Yes, Susan L recommends this product! I really like the mesh vest / harness! My pup does not seem to mind it, since it is lightweight and cool when it is hot outside. Booboo seems to enjoy his walks with his new vest too! Love these all year round! Posted On 03/07/16 by Marie O from Hoboken, NJ Yes, Marie O recommends this product! I have been buying these harnesses for several years now. They are great for warm weather and perfect under a shirt or sweater that has the leash hole in the cooler months, so its not too bulky. I have them in every color . My Yorkie is 6 pounds, neck is 9" Girth is 13.5" his length is 10" He is kind of in between sizes in this product, I buy the small and I just have to make it a little smaller around his body, its actually very easy to sew on the mesh and totally worth it.